Need some inspiration? 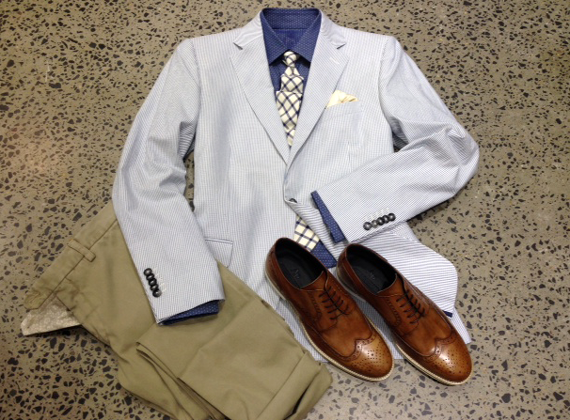 Our stylist has put together a great summer outfit for you to try – mixing and matching with our luxurious tailored jacket and a casual pair of chinos. The silhouette of a suit is its outline – when it comes to summer you’ll be looking to avoid suits with a lot of padding and lining on the inside. A trans-seasonal suit should breathe well during summer, and once winter approaches you can easily layer up with a wool jumper or a coat. When you’re investing in a high quality suit you always need to consider whether you’ll be able to use it regardless of whether it’s winter or summer. Let’s cover off a few essential factors to take into consideration to ensure you’re splurging on a versatile trans-seasonal suit. When it comes to light fabrics, yes linen can be worn with much more ease; however, this fabric doesn’t translate well into the professional office atmosphere. Particularly when summer is over! The most versatile option to invest in would be suits made from lightweight wools or cotton – they breathe well and they’re normally wrinkle-resistant. Bold, light coloured suits might be the next biggest trend this summer season, however, you should be investing in hues that you’ll feel comfortable and confident in wearing, particularly around the office. If you’re spending a lot of time outdoors on a day-to-day basis then investing in lighter shades will certainly help to keep you cooler. If you aren’t one to shy away from fashion forward trends then you can go as light as you want. But for those that prefer to play it safe there are always lighter shades of grey or lighter shades of navy blue that you can try instead. GROOMS GUIDE: WEDDINGS WITH A COMPLICATED FAMILY.